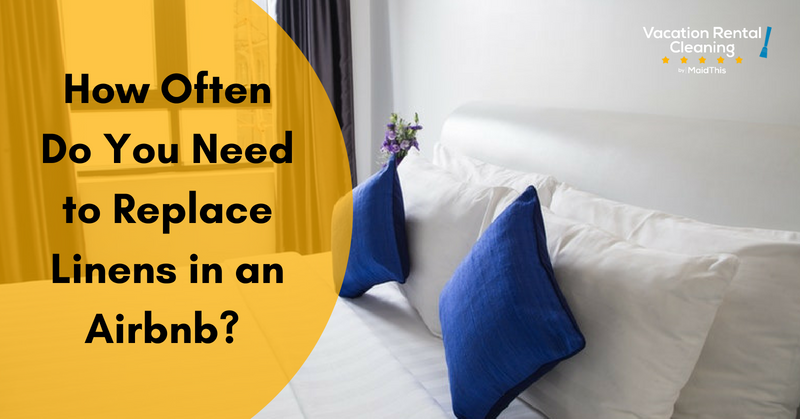 How Often Do You Need to Replace Linens in an Airbnb? Being a vacation rental host requires a lot of attention to detail. To ensure you get great reviews from your guests, it’s up to you to ensure your place is looking just like it does in your listing photos. Part of maintaining a stellar vacation rental is discerning when it’s time to replace linens and other things in your Airbnb. From sheets and towels to the carpeting, everything has to be considered. Here’s a quick breakdown of the things you should be prepared to replace and when you should be doing it. Your linens really go through the ringer if you stop and think about it. Depending on how busy your vacation rental gets, they get used A LOT and then get washed after every guest has checked out. That’s likely more wear-and-tear than what you put your own linens through at home. Before you know it, your vacation rental sheets and towels can start to look a little ratty….especially if/when your guests use the towels to clean up spills or makeup – ahhhh! Sheets: If you’ve got a high occupancy rate year-round, aim to replace your sheets every 6-12 months at least. If you’re not booked as frequently, once a year should do it. Obviously, if you find any kind of ripping or tears or if stains pop up on your sheets, toss them out immediately and replace them. Pillows: Pillows can be washed but even the best washing machine can’t rid them entirely of loose dead skin cells and germs that accumulate over time. The best option is to replace the bed pillows at least every 6 months. Bath Towels: It doesn’t take long for bath towels to start looking worn out. Again, depending on how consistently you’re booked throughout the year, aim to change these out every 3-6 months. This is especially important if you provide white or light-colored towels as they’ll show signs of wear faster than darker towels. Hand Towels: Stock up on hand towels. These take a real beating and should be replaced at least when you replace your bath towels. It’s smart to buy extra hand towels when you buy your bath towels so you’ve got a few on hand if you should ever need them. Kitchen Towels: If you choose to provide kitchen or tea towels to your guests in addition to paper towels, plan to replace these every 6-12 months. Unlike your other linens, kitchen towels may not get used as much; it all depends on how regularly your guests cook. Check these often and look out for signs of wear or stains. These are the least expensive and, arguably, the easiest linens to replace, so don’t dilly-dally! When replacing linens, don’t be tempted to take the cheap route. Consider this an investment in your business and purchase at least mid-range sheets and towels for your guests. If you enjoy the hunt, check out discount stores like TJ Maxx, Marshalls, or Stein Mart. If you’d prefer to skip what can sometimes turn into a wild goose chase, the Threshold or Fieldcrest brands from Target or this option from Amazon* also a good bet. You certainly don’t need to purchase top-of-the-line linens, but be sure to consider quality over price when you shop… After all, the goal is to limit headaches AND get you that 5-star review! Chances are, your major appliances and home mechanical systems (like your HVAC) don’t get much use if you’re renting out your entire home. The washing machine, dishwasher, and kitchen appliances likely don’t see much use until your guests check out and your thermostat runs consistently without much thought. Thankfully, that probably means they’re in fairly good shape and you won’t need to replace anything anytime soon. If you rent a room and live in your home full-time, you’re operating things often enough that you have a leg up in this department: You can spot things before anyone else does. If this doesn’t apply to you, however, you must remain vigilant! Unlike linens that should be carefully monitored and replaced at the first signs of overuse, appliances are harder to plan ahead for. We simply expect these machines to function properly until the day… well, the day they don’t. It would be silly for us to suggest you to sit in front of your dishwasher or washing machine and watch for glitches or sit idly and wait for the thermostat to act strangely. However, keep a watchful eye on these things anytime you do a walk-through of your vacation rental. It’s smart to ask your guests to report anything that seems “off” if they operate any of your appliances but it’s even better if you can catch wind of trouble before your guests see it. If you don’t visit your vacation rental often, ask your cleaning team or management company to let you know if they notice anything operating oddly when they conduct turnover cleanings or walk-throughs. They are your best reporters. Carpet is a lasting floor covering and doesn’t need replacing often. That’s probably a relief, considering how expensive it can be to make a flooring change. The frustrating thing about carpet is that it doesn’t wear evenly. Heavier traffic areas like the living room, hallways, and bedroom doorways show their age more rapidly; the aging pace increases if shoes are worn inside the house or if you have or allow your guests to bring pets. Generally speaking, carpet should last anywhere from 7-10 years after it’s been installed. With proper care, you could get as many as 15 years out of it. Invest in doormats. Doormats at the front entrance and any other doors leading outside with greatly decrease the amount of dirt and dust carried into your vacation rental from your guests’ shoes. This is your best first line of defense. Vacuum often. Some sources will suggest you vacuum every day while others will recommend once or twice a week. Daily vacuuming in a vacation rental is likely next to impossible – you certainly shouldn’t ask your guests to do it! However, be sure to run the vacuum after every checkout. If your guests are staying long-term, offer them basic maid services weekly or bi-weekly to ensure your carpet is getting the care it needs. To know when it’s time to recarpet your place, look out for visible signs of wear through main walkways. When a deep cleaning doesn’t do much to revitalize it, it may be time to go shopping. Ensuring your guests are happy should start before they even arrive for check-in. By keeping a watchful eye on your place and replacing or revitalizing things before they show they need it, you’re setting yourself up for great reviews and referrals.